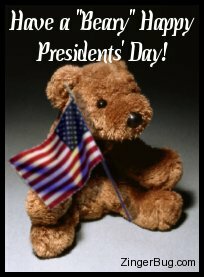 Happy Presidents' Day Greetings, Comments and Glitter Graphics! Presidents' Day (also spelled President's Day or Presidents Day) was originally celebrated as the birthdays of George Washington (February 22) and Abraham Lincoln (February 12). While the roots of the holiday are still its primary celebration, it is also considered a celebration of the American presidency in general. These comments include glitter graphics as well as images of famous presidents and Mount Rushmore. These comments are perfect for posting on Blogger, Facebook, Twitter or any other friend site or blog.